Narendra Damodardas Modi (pronounced [ˈnəɾendrə dɑmodəɾˈdɑs ˈmodiː] ( listen); born 17 September 1950) is an Indian politician serving as the 14th and current Prime Minister of India since 2014. He was the Chief Minister of Gujarat from 2001 to 2014, and is the Member of Parliament for Varanasi. Modi is a member of the Bharatiya Janata Party (BJP), and of the Rashtriya Swayamsevak Sangh (RSS), a Hindu nationalist volunteer organisation. Born to a Gujarati family in Vadnagar, Modi helped his father sell tea as a child, and has said he later ran his own stall. He was introduced to the RSS at the age of eight, beginning a long association with the organisation. Modi left home after finishing high-school in part due to an arranged marriage to Jashodaben Chimanlal, which he abandoned, and publicly acknowledged only many decades later. Modi travelled around India for two years and visited a number of religious centres before returning to Gujarat. In 1971 he became a full-time worker for the RSS. During the state of emergency imposed across the country in 1975, Modi was forced to go into hiding. The RSS assigned him to the BJP in 1985, and he held several positions within the party hierarchy until 2001, rising to the rank of General Secretary. Narendra Modi was born on 17 September 1950 to a family of grocers in Vadnagar, Mehsana district, Bombay State (present-day Gujarat). He was the third of six children born to Damodardas Mulchand Modi (c.1915 – 1989) and Hiraben Modi (born c.1920). Modi's family belonged to the Modh-Ghanchi-Teli (oil-presser) community, which is categorised as an Other Backward Class by the Indian government. As a child, Modi helped his father sell tea at the Vadnagar railway station, and said that he later ran a tea stall with his brother near a bus terminus. Modi completed his higher secondary education in Vadnagar in 1967, where a teacher described him as an average student and a keen debater, with interest in theatre. Modi had an early gift for rhetoric in debates, and his teachers and students noted this. Modi preferred playing larger-than-life characters in theatrical productions, which has influenced his political image. When eight years old, Modi discovered the Rashtriya Swayamsevak Sangh (RSS) and began attending its local shakhas (training sessions). There, Modi met Lakshmanrao Inamdar, popularly known as Vakil Saheb, who inducted him as a balswayamsevak (junior cadet) in the RSS and became his political mentor. While Modi was training with the RSS, he also met Vasant Gajendragadkar and Nathalal Jaghda, Bharatiya Jana Sangh leaders who were founding members of the BJP's Gujarat unit in 1980. Also in Narendra Modi's childhood, in a custom traditional to his caste, his family arranged a betrothal to a girl, Jashodaben Chimanlal, leading to their marriage when they were teenagers. Sometime thereafter, he abandoned the further marital obligations implicit in the custom, and left home, the couple going on to lead separate lives, neither marrying again, and the marriage itself remaining unmentioned in Modi's public pronouncements for many decades. In April 2014, shortly before the national elections that swept him to power, Modi publicly affirmed that he was married and his spouse was Ms Chimanlal; the couple has remained married, but estranged. Modi spent the ensuing two years travelling across Northern and North-eastern India, though few details of where he went have emerged. In interviews, Modi has described visiting Hindu ashrams founded by Swami Vivekananda: the Belur Math near Kolkata, followed by the Advaita Ashrama in Almora and the Ramakrishna Mission in Rajkot. Modi remained only a short time at each, since he lacked the required college education. Vivekananda has been described as a large influence in Modi's life. In the early summer of 1968, Modi reached the Belur Math but was turned away, after which Modi wandered through Calcutta, West Bengal and Assam, stopping in Siliguri and Guwahati. Modi then went to the Ramakrishna Ashram in Almora, where he was again rejected, before travelling back to Gujarat via Delhi and Rajasthan in 1968–69. Sometime in late 1969 or early 1970, Modi returned to Vadnagar for a brief visit before leaving again for Ahmedabad. There, Modi lived with his uncle, working in the latter's canteen at the Gujarat State Road Transport Corporation. In Ahmedabad, Modi renewed his acquaintance with Inamdar, who was based at the Hedgewar Bhavan (RSS headquarters) in the city. After the Indo-Pakistani War of 1971, he stopped working for his uncle and became a full-time pracharak (campaigner) for the RSS, working under Inamdar. Shortly before the war, Modi took part in a non-violent protest against the Indian government in New Delhi, for which he was arrested; this has been cited as a reason for Inamdar electing to mentor him. Many years later Modi would co-author a biography of Inamdar, published in 2001. In 1978 Modi received a Bachelor of Arts degree in political science from School of Open Learning at University of Delhi, graduating with a third class. Five years later, in 1983, he received a Master of Arts degree in political science from Gujarat University, as an external distance learning student. In June 1975, Prime Minister Indira Gandhi declared a state of emergency in India which lasted until 1977. During this period, known as "The Emergency", many of her political opponents were jailed and opposition groups were banned. Modi was appointed general secretary of the "Gujarat Lok Sangharsh Samiti", an RSS committee coordinating opposition to the Emergency in Gujarat. Shortly afterwards, the RSS was banned. Modi was forced to go underground in Gujarat and frequently travelled in disguise to avoid arrest. He became involved in printing pamphlets opposing the government, sending them to Delhi and organising demonstrations. Modi was also involved with creating a network of safe houses for individuals wanted by the government, and in raising funds for political refugees and activists. During this period, Modi wrote a book in Gujarati, Sangharsh Ma Gujarat (In The Struggles of Gujarat), describing events during the Emergency. Among the people he met in this role was trade unionist and socialist activist George Fernandes, as well as several other national political figures. In his travels during the Emergency, Modi was often forced to move in disguise, once dressing as a monk, and once as a Sikh. Modi became an RSS sambhag pracharak (regional organiser) in 1978, overseeing RSS activities in the areas of Surat and Vadodara, and in 1979 he went to work for the RSS in Delhi, where he was put to work researching and writing the RSS's version of the history of the Emergency. He returned to Gujarat a short while later, and was assigned by the RSS to the BJP in 1985. In 1987 Modi helped organise the BJP's campaign in the Ahmedabad municipal election, which the BJP won comfortably; Modi's planning has been described as the reason for that result by biographers. After L. K. Advani became president of the BJP in 1986, the RSS decided to place its members in important positions within the BJP; Modi's work during the Ahmedabad election led to his selection for this role, and Modi was elected organising secretary of the BJP's Gujarat unit later in 1987. Modi rose within the party and was named a member of the BJP's National Election Committee in 1990, helping organise L. K. Advani's 1990 Ram Rath Yatra in 1990 and Murli Manohar Joshi's 1991–92 Ekta Yatra (Journey for Unity). However, he took a brief break from politics in 1992, instead establishing a school in Ahmedabad; friction with Shankersingh Vaghela, a BJP MP from Gujarat at the time, also played a part in this decision. Modi returned to electoral politics in 1994, partly at the insistence of Advani, and as party secretary, Modi's electoral strategy was considered central to the BJP victory in the 1995 state assembly elections. In November of that year Modi was elected BJP national secretary and transferred to New Delhi, where he assumed responsibility for party activities in Haryana and Himachal Pradesh. The following year, Shankersinh Vaghela, a prominent BJP leader from Gujarat, defected to the Indian National Congress (Congress, INC) after losing his parliamentary seat in the Lok Sabha elections. Modi, on the selection committee for the 1998 Assembly elections in Gujarat, favoured supporters of BJP leader Keshubhai Patel over those supporting Vaghela to end factional division in the party. His strategy was credited as key to the BJP winning an overall majority in the 1998 elections, and Modi was promoted to BJP general secretary (organisation) in May of that year. In 2001, Keshubhai Patel's health was failing and the BJP lost a few state assembly seats in by-elections. Allegations of abuse of power, corruption and poor administration were made, and Patel's standing had been damaged by his administration's handling of the earthquake in Bhuj in 2001. The BJP national leadership sought a new candidate for the chief ministership, and Modi, who had expressed misgivings about Patel's administration, was chosen as a replacement. Although BJP leader L. K. Advani did not want to ostracise Patel and was concerned about Modi's lack of experience in government, Modi declined an offer to be Patel's deputy chief minister, telling Advani and Atal Bihari Vajpayee that he was "going to be fully responsible for Gujarat or not at all". On 3 October 2001 he replaced Patel as Chief Minister of Gujarat, with the responsibility of preparing the BJP for the December 2002 elections. Modi was sworn in as Chief Minister on 7 October 2001, and entered the Gujarat state legislature on 24 February 2002 by winning a by-election to the Rajkot – II constituency, defeating Ashwin Mehta of the INC by 14,728 votes. On 27 February 2002, a train with several hundred passengers burned near Godhra, killing approximately 60 people. [e] The train carried a large number of Hindu pilgrims returning from Ayodhya after a religious ceremony at the site of the demolished Babri Masjid. In making a public statement after the incident, Modi said that the attack had been terror attack planned by local Muslims. The next day, the Vishwa Hindu Parishad called for a bandh across the state. Riots began during the bandh, and anti-Muslim violence spread through Gujarat. The government's decision to move the bodies of the train victims from Godhra to Ahmedabad further inflamed the violence. The state government stated later that 790 Muslims and 254 Hindus were killed. Independent sources put the death toll at over 2000. Approximately 150,000 people were driven to refugee camps. Numerous women and children were among the victims; the violence included mass rapes and mutilations of women. The government of Gujarat itself is generally considered by scholars to have been complicit in the riots, and has otherwise received heavy criticism for its handling of the situation. Several scholars have described the violence as a pogrom, while others have called it an example of state terrorism. Summarising academic views on the subject, Martha Nussbaum said: "There is by now a broad consensus that the Gujarat violence was a form of ethnic cleansing, that in many ways it was premeditated, and that it was carried out with the complicity of the state government and officers of the law." The Modi government imposed a curfew in 26 major cities, issued shoot-at-sight orders and called for the army to patrol the streets, but was unable to prevent the violence from escalating. The president of the state unit of the BJP expressed support for the bandh, despite such actions being illegal at the time. State officials later prevented riot victims from leaving the refugee camps, and the camps were often unable to meet the needs of those living there. Muslim victims of the riots were subject to further discrimination when the state government announced that compensation for Muslim victims would be half of that offered to Hindus, although this decision was later reversed after the issue was taken to court. During the riots, police officers often did not intervene in situations where they were able. In 2012 Maya Kodnani, a minister in Modi's government from 2007 to 2009, was convicted by a lower court for participation in the Naroda Patiya massacre during the 2002 riots. Although Modi's government had announced that it would seek the death penalty for Kodnani on appeal, it reversed its decision in 2013. On 21 April 2018, the Gujarat High Court acquitted Kodnani while noting that there were several shortfalls in the investigation. Modi's personal involvement in the 2002 events has continued to be debated. During the riots, Modi said that "What is happening is a chain of action and reaction." Later in 2002, Modi said the way in which he had handled the media was his only regret regarding the episode. Modi has not offered an apology for the riots and has stated that he should be rather punished and not forgiven if he is guilty. In March 2008, the Supreme Court reopened several cases related to the 2002 riots, including that of the Gulbarg Society massacre, and established a Special Investigation Team (SIT) to look into the issue. In response to a petition from Zakia Jafri (widow of Ehsan Jafri, who was killed in the Gulbarg Society massacre), in April 2009 the court also asked the SIT to investigate the issue of Modi's complicity in the killings. The SIT questioned Modi in March 2010; in May, it presented to the court a report finding no evidence against him. In July 2011, the court-appointed amicus curiae Raju Ramachandran submitted his final report to the court. Contrary to the SIT's position, he said that Modi could be prosecuted based on the available evidence. The Supreme Court gave the matter to the magistrate's court. The SIT examined Ramachandran's report, and in March 2012 submitted its final report, asking for the case to be closed. Zakia Jaffri filed a protest petition in response. In December 2013 the magistrate's court rejected the protest petition, accepting the SIT's finding that there was no evidence against the chief minister. In the aftermath of the violence there were widespread calls for Modi to resign as chief minister from within and outside the state, including from leaders of the Dravida Munnetra Kazhagam and the Telugu Desam Party (allies in the BJP-led National Democratic Alliance coalition), and opposition parties stalled Parliament over the issue. Modi submitted his resignation at the April 2002 BJP national executive meeting in Goa, but it was not accepted. His cabinet had an emergency meeting on 19 July 2002, after which it offered its resignation to the Gujarat Governor S. S. Bhandari, and the state assembly was dissolved. Despite opposition from the election commissioner, who said that a number of voters were still displaced, Modi succeeded in advancing the election to December 2002. In the elections, the BJP won 127 seats in the 182-member assembly. Although Modi later denied it, he made significant use of anti-Muslim rhetoric during his campaign, and the BJP profited from religious polarisation among the voters. He won the Maninagar constituency, receiving 1,13,589 of 1,54,981 votes and defeating INC candidate Yatin Oza by 75,333 votes. On 22 December 2002, Bhandari swore Modi in for a second term. Modi framed the criticism of his government for human rights violations as an attack upon Gujarati pride, a strategy which led to the BJP winning two-thirds of the seats in the state assembly. During Modi's second term the rhetoric of the government shifted from Hindutva to Gujarat's economic development. Modi curtailed the influence of Sangh Parivar organisations such as the Bharatiya Kisan Sangh (BKS) and the Vishva Hindu Parishad (VHP), entrenched in the state after the decline of Ahmedabad's textile industry, and dropped Gordhan Zadafia (an ally of former Sangh co-worker and VHP state chief Praveen Togadia) from his cabinet. When the BKS staged a farmers' demonstration Modi ordered their eviction from state-provided houses, and his decision to demolish 200 illegal temples in Gandhinagar deepened the rift with the VHP. Sangh organisations were no longer consulted or informed in advance about Modi's administrative decisions. Nonetheless, Modi retained connections with some Hindu nationalists. Modi wrote a foreword to a textbook by Dinanath Batra released in 2014, which stated that ancient India possessed technologies including test-tube babies. Modi's relationship with Muslims continued to attract criticism. Prime Minister Atal Bihari Vajpayee (who asked Modi for tolerance in the aftermath of the 2002 Gujarat violence and supported his resignation as chief minister) distanced himself, reaching out to North Indian Muslims before the 2004 Lok Sabha elections. After the elections Vajpayee called the violence in Gujarat a reason for the BJP's electoral defeat and said it had been a mistake to leave Modi in office after the riots. Questions about Modi's relationship with Muslims were also raised by many Western nations during his tenure as chief minister. Modi was barred from entering the United States by the State Department, in accordance with the recommendations of the Commission on International Religious Freedom formed under the aegis of the International Religious Freedom Act, the only person denied a US visa under this law. The UK and the European Union refused to admit him because of what they saw as his role in the riots. As Modi rose to prominence in India, the UK and the EU lifted their bans in October 2012 and March 2013, respectively, and after his election as prime minister he was invited to Washington. During the run-up to the 2007 assembly elections and the 2009 general election, the BJP intensified its rhetoric on terrorism. In July 2006, Modi criticised Prime Minister Manmohan Singh " for his reluctance to revive anti-terror legislation" such as the 2002 Prevention of Terrorism Act. He asked the national government to allow states to invoke tougher laws in the wake of the 2006 Mumbai train bombings. In 2007 Modi authored Karmayog, a 101-page booklet discussing manual scavenging. In it, Modi argued that scavenging was a "spiritual experience" for Valmiks, a sub-caste of Dalits. However, this book was not circulated that time because of the election code of conduct. After the November 2008 Mumbai attacks, Modi held a meeting to discuss the security of Gujarat's 1,600-kilometre (990 mi)-long coastline, resulting in government authorisation of 30 high-speed surveillance boats. In July 2007 Modi completed 2,063 consecutive days as chief minister of Gujarat, making him the longest-serving holder of that post, and the BJP won 122 of 182 state-assembly seats in that year's election. The Sardar Sarovar Dam during a 2006 height increase. As Chief Minister, Modi favoured privatisation and small government, which was at odds with the philosophy of the RSS, usually described as anti-privatisation and anti-globalisation. His policies during his second term have been credited with reducing corruption in the state. He established financial and technology parks in Gujarat and during the 2007 Vibrant Gujarat summit, real-estate investment deals worth ₹6.6 trillion were signed. The governments led by Patel and Modi supported NGOs and communities in the creation of groundwater-conservation projects. By December 2008, 500,000 structures had been built, of which 113,738 were check dams, which helped recharge the aquifers beneath them. Sixty of the 112 tehsils which had depleted the water table in 2004 had regained their normal groundwater levels by 2010. As a result, the state's production of genetically modified cotton increased to become the largest in India. The boom in cotton production and its semi-arid land use led to Gujarat's agricultural sector growing at an average rate of 9.6 percent from 2001 to 2007. Public irrigation measures in central and southern Gujarat, such as the Sardar Sarovar Dam, were less successful. The Sardar Sarovar project only irrigated 4–6% of the area intended. Nonetheless, from 2001 to 2010 Gujarat recorded an agricultural growth rate of 10.97 percent – the highest of any state. However, sociologists have pointed out that the growth rate under the 1992–97 INC government was 12.9 percent. In 2008 Modi offered land in Gujarat to Tata Motors to set up a plant manufacturing the Nano after a popular agitation had forced the company to move out of West Bengal. Several other companies followed the Tata's to Gujarat. The Modi government finished the process of bringing electricity to every village in Gujarat that its predecessor had almost completed. Modi significantly changed the state's system of power distribution, greatly impacting farmers. Gujarat expanded the Jyotigram Yojana scheme, in which agricultural electricity was separated from other rural electricity; the agricultural electricity was rationed to fit scheduled irrigation demands, reducing its cost. Although early protests by farmers ended when those who benefited found that their electricity supply had stabilised, according to an assessment study corporations and large farmers benefited from the policy at the expense of small farmers and labourers. Modi addressing graduates of the Gujarat National Law University in 2012. A contentious debate surrounds the assessment of Gujarat's economic development during Modi's tenure as chief minister. The state's GDP growth rate averaged 10% during Modi's tenure, a value similar to other highly industrialised states, and above that of the country as a whole. Gujarat also had a high rate of economic growth in the 1990s, before Modi took office, and scholars have stated that growth did not accelerate during Modi's tenure. Under Modi, Gujarat topped the World Bank's "ease of doing business" rankings among Indian states for two consecutive years. In 2013, Gujarat was ranked first among Indian states for "economic freedom" by a report measuring governance, growth, citizens' rights and labour and business regulation among the country's 20 largest states. In the later years of Modi's government, Gujarat's economic growth was frequently used as an argument to counter allegations of communalism. Tax breaks for businesses were easier to obtain in Gujarat than in other states, as was land. Modi's policies to make Gujarat attractive for investment included the creation of Special Economic Zones, where labour laws were greatly weakened. Despite its growth rate, Gujarat had a relatively poor record on human development, poverty relief, nutrition and education during Modi's tenure. In 2013, Gujarat ranked 13th in the country with respect to rates of poverty and 21st in education. Nearly 45 percent of children under five were underweight and 23 percent were undernourished, putting the state in the "alarming" category on the India State Hunger Index. A study by UNICEF and the Indian government found that Gujarat under Modi had a poor record with respect to immunisation in children. Over the decade from 2001 to 2011, Gujarat did not change its position relative to the rest of the country with respect to poverty and female literacy, remaining near the median of the 29 Indian states. It showed only a marginal improvement in rates of infant mortality, and its position with respect to individual consumption declined. With respect to the quality of education in government schools, the state ranked below most Indian states. The social policies of the government generally did not benefit Muslims, Dalits, and Adivasis, and generally increased social inequalities. Development in Gujarat was generally limited to the urban middle class, and citizens in rural areas or from lower castes were increasingly marginalised. In 2013 the state ranked 10th of 21 Indian states in the Human Development Index. Under Modi, the state government spent far less than the national average on education and healthcare. Modi with Anandiben Patel at a meeting of BJP MLAs after his election as prime minister; Patel succeeded him as Gujarat chief minister. Despite the BJP's shift away from explicit Hindutva, Modi's election campaign in 2007 and 2012 contained elements of Hindu nationalism. Modi only attended Hindu religious ceremonies, and had prominent associations with Hindu religious leaders. During his 2012 campaign he twice refused to wear articles of clothing gifted by Muslim leaders. He did, however, maintain relations with Dawoodi Bohra. His campaign included references to issues known to cause religious polarisation, including to Afzal Guru and the killing of Sohrabuddin Sheikh. The BJP did not nominate any Muslim candidates for the assembly election of 2012. During the 2012 campaign, Modi attempted to identify himself with the state of Gujarat, a strategy similar to that used by Indira Gandhi during the Emergency, and projected himself as protecting Gujarat against persecution by the rest of India. While campaigning for the 2012 assembly elections, Modi made extensive use of holograms and other technologies allowing him to reach a large number of people, something he would repeat in the 2014 general election. In the 2012 Gujarat Legislative Assembly elections, Modi won the constituency of Maninagar by 86,373 votes over Shweta Bhatt, the INC candidate and wife of Sanjiv Bhatt. The BJP won 115 of the 182 seats, continuing its majority during his tenure and allowing the party to form the government (as it had in Gujarat since 1995). In later by-elections the BJP won four more assembly seats and two Lok Sabha seats held by the INC, although Modi did not campaign for its candidates. In 2013, the Wharton India Economic Forum (WIEF) at the Wharton School of the University of Pennsylvania cancelled a keynote video-conference speech by Modi following protests by Indian-Americans. After his election as prime minister, Modi resigned as the chief minister and as an MLA from Maninagar on 21 May 2014. Anandiben Patel succeeded him as the chief minister. In September 2013 Modi was named the BJP's candidate for prime minister in the 2014 Lok Sabha election. Several BJP leaders expressed opposition to Modi's candidature, including BJP founding member L. K. Advani, who cited concern with leaders who were "concerned with their personal agendas". Modi played a dominant role in the BJP's election campaign. Several people who voted for the BJP stated that if Modi had not been the prime-ministerial candidate, they would have voted for another party. The focus on Modi as an individual was unusual for a BJP election campaign. The election was described as a referendum on Narendra Modi. During the campaign, Modi focused on the corruption scandals under the previous INC government, and played on his image as a politician who had created a high rate of GDP growth in Gujarat. Modi projected himself as a person who could bring about "development," without focus on any specific policies. His message found support among young Indians and among middle-class citizens. The BJP under Modi was able to downplay concerns about the protection of religious minorities and Modi's commitment to secularism, areas in which he had previously received criticism. Prior to the election Modi's image in the media had centered around his role in the 2002 Gujarat riots, but during the campaign the BJP was able to shift this to a focus on Modi's neoliberal ideology and the Gujarat model of development, although Hindutva remained a significant part of its campaign. The BJP's campaign was assisted by its wide influence in the media. Modi's campaign blitz cost approximately ₹50 billion (US$700 million), and received extensive financial support from corporate donors. In addition to more conventional campaign methods, Modi made extensive use of social media, and addressed more than 1000 rallies via hologram appearances. The BJP won 31% of the vote, and more than doubled its tally in the Lok Sabha to 282, becoming the first party to win a majority of seats on its own since 1984. Voter dissatisfaction with the INC, as well as with regional parties in North India, was another reason for the success of the BJP, as was the support from the RSS. In states such as Uttar Pradesh in which the BJP performed well, it drew exceptionally high support from upper-caste Hindus, although the 10 percent of Muslim votes won was more than it had won before. It performed particularly well in parts of the country that had recently experienced violence between Hindus and Muslims. The magnitude of the BJP's victory led many commentators to say that the election constituted a political realignment away from progressive parties and towards the right-wing. Modi's tweet announcing his victory was described as being emblematic of the political realignment away from a secular, socialist state towards capitalism and Hindu cultural nationalism. Modi himself was a candidate for the Lok Sabha in two constituencies: Varanasi and Vadodara. He won in both constituencies, defeating Aam Aadmi Party leader Arvind Kejriwal in Varanasi and Madhusudan Mistry of the INC in Vadodara by 570,128 votes. Modi, who was unanimously elected leader of the BJP, was appointed prime minister by India's president. To comply with the law that an MP cannot represent more than one constituency, he vacated the Vadodara seat. For a chronological guide to this subject, see Timeline of the premiership of Narendra Modi. Modi was sworn in as the Prime Minister of India on 26 May 2014. He became the first Prime Minister born after India's independence from the British Empire. His first year as prime minister saw significant centralisation of power relative to previous administrations. Modi's efforts at centralisation have been linked to an increase in the number of senior administration officials resigning their positions. Initially lacking a majority in the Rajya Sabha, or upper house of Indian Parliament, Modi passed a number of ordinances to enact his policies, leading to further centralisation of power. The government also passed a bill increasing the control that it had over the appointment of judges, and reducing that of the judiciary. In December 2014 Modi abolished the Planning Commission, replacing it with the National Institution for Transforming India, or NITI Aayog. The move had the effect of greatly centralising the power previously with the planning commission in the person of the prime minister. The planning commission had received heavy criticism in previous years for creating inefficiency in the government, and of not filling its role of improving social welfare: however, since the economic liberalisation of the 1990s, it had been the major government body responsible for measures related to social justice. The Modi government launched investigations by the Intelligence Bureau against numerous civil society organizations and foreign non-governmental organizations in the first year of the administration. The investigations, on the grounds that these organizations were slowing economic growth, was criticized as a witchhunt. International humanitarian aid organisation Medecins Sans Frontieres was among the groups that were put under pressure. Other organisations affected included the Sierra Club and Avaaz. Cases of sedition were filed against individuals criticising the government. This led to discontent within the BJP regarding Modi's style of functioning and drew comparisons to the governing style of Indira Gandhi. Modi repealed 1,200 obsolete laws in first three years as prime minister; a total of 1,301 such laws had been repealed by previous governments over a span of 64 years. He started a monthly radio programme titled "Mann Ki Baat" on 3 October 2014. Modi also launched the Digital India programme, with the goal of ensuring that government services are available electronically, building infrastructure to provide high-speed Internet access to rural areas, boosting manufacturing of electronic goods in the country, and promoting digital literacy. Modi with other BRICS leaders in 2016. Left to right: Temer, Modi, Xi, Putin and Zuma. The economic policies of Modi's government focused on privatisation and liberalisation of the economy, based on a neoliberal framework. Modi liberalised India's foreign direct investment policies, allowing more foreign investment in several industries, including in defence and the railways. Other proposed reforms included making it harder for workers to form unions and easier for employers to hire and fire them; some of these proposals were dropped after protests. The reforms drew strong opposition from unions: on 2 September 2015, eleven of the country's largest unions went on strike, including one affiliated with the BJP. The Bharatiya Mazdoor Sangh, a constituent of the Sangh Parivar, stated that the underlying motivation of labour reforms favored corporations over labourers. The funds dedicated to poverty reduction programmes and social welfare measures were greatly decreased by the Modi administration. The money spent on social programmes declined from 14.6% of GDP during the Congress government to 12.6% during Modi's first year in office. Spending on health and family welfare declined by 15%, and on primary and secondary education by 16%. The budgetary allocation for the Sarva Shiksha Abhiyan, or the "education for all" programme, declined by 22%. The government also lowered corporate taxes, abolished the wealth tax, increased sales taxes, and reduced customs duties on gold, and jewelry. In October 2014, the Modi government deregulated diesel prices. In September 2014, Modi introduced the Make in India initiative to encourage foreign companies to manufacture products in India, with the goal of turning the country into a global manufacturing hub. Supporters of economic liberalisation supported the initiative, while critics argued it would allow foreign corporations to capture a greater share of the Indian market. Modi's administration passed a land-reform bill that allowed it to acquire private agricultural land without conducting a social impact assessment, and without the consent of the farmers who owned it. The bill was passed via an executive order after it faced opposition in parliament, but was eventually allowed to lapse. Modi's government put in place the Goods and Services Tax, the biggest tax reform in the country since independence. It subsumed around 17 different taxes and became effective from 1 July 2017. In his first cabinet decision, Modi set up a team to investigate black money. On 9 November 2016, the government demonetised ₹500 and ₹1000 banknotes, with the stated intention of curbing corruption, black money, the use of counterfeit currency, and terrorism. The move led to severe cash shortages, a steep decline in the Indian stock indices BSE SENSEX and NIFTY 50, and sparked widespread protests throughout the country. Several deaths were linked to the rush to exchange cash. In the subsequent year, the number of income tax returns filed for individuals rose by 25%, and the number of digital transactions increased steeply. Over the first four years of Modi's premiership, India's GDP grew at an average rate of 7.23%, higher than the rate of 6.39% under the previous government. The level of income inequality increased, while an internal government report said that in 2017, unemployment had increased to its highest level in 45 years. The loss of jobs was attributed to the 2016 demonetization, and to the effects of the Goods and Services Tax. In his first year as prime minister, Modi reduced the amount of money spent by the central government on healthcare. The Modi government launched New Health Policy (NHP) in January 2015. The policy did not increase the government's spending on healthcare, instead emphasizing the role of private healthcare organisations. This represented a shift away from the policy of the previous Congress government, which had supported programmes to assist public health goals, including reducing child and maternal mortality rates. The National Health Mission, which included public health programmes targeted at these indices received nearly 20% less funds in 2015 than in the previous year. 15 national health programmes, including those aimed at controlling tobacco use and supporting healthcare for the elderly, were merged with the National Health Mission. In its budget for the second year after it took office, the Modi government reduced healthcare spending by 15%. The healthcare budget for the following year rose by 19%. The budget was viewed positively by private insurance providers. Public health experts criticised its emphasis on the role of private healthcare providers, and suggested that it represented a shift away from public health facilities. The healthcare budget rose by 11.5% in 2018; the change included an allocation of 2000 crore for a government-funded health insurance program, and a decrease in the budget of the National Health Mission. The government introduced stricter packaging laws for tobacco which requires 85% of the packet size to be covered by pictorial warnings. An article in the medical journal Lancet stated that the country "might have taken a few steps back in public health" under Modi. In 2018 Modi launched the Ayushman Bharat Yojana, a government health insurance scheme intended to insure 500 million people. 1 lakh people had signed up by October 2018. Modi emphasised his government's efforts at sanitation as a means of ensuring good health. On 2 October 2014, Modi launched the Swachh Bharat Abhiyan ("Clean India") campaign. The stated goals of the campaign included eliminating open defecation and manual scavenging within five years. As part of the programme, the Indian government began constructing millions of toilets in rural areas and encouraging people to use them. The government also announced plans to build new sewage treatment plants. The administration plans to construct 60 million toilets by 2019. The construction projects have faced allegations of corruption, and have faced severe difficulty in getting people to use the toilets constructed for them. Sanitation cover in the country increased from 38.7% in October 2014 to 84.1% in May 2018; however, usage of the new sanitary facilities lagged behind the government's targets. In 2018, the World Health Organization stated that at least 180,000 diarrhoeal deaths were averted in rural India after the launch of the sanitation effort. During the 2014 election campaign, the BJP sought to identify itself with political leaders known to have opposed Hindu nationalism, including B. R. Ambedkar, Subhas Chandra Bose, and Ram Manohar Lohia. The campaign also saw the use of rhetoric based on Hindutva by BJP leaders in certain states. Communal tensions were played upon especially in Uttar Pradesh and the states of Northeast India. A proposal for the controversial Uniform Civil Code was a part of the BJP's election manifesto. The activities of a number of Hindu nationalist organisations increased in scope after Modi's election as Prime Minister, sometimes with the support of the government. These activities included a Hindu religious conversion programme, a campaign against the alleged Islamic practice of "Love Jihad", and attempts to celebrate Nathuram Godse, the assassin of Mahatma Gandhi, by members of the right wing Hindu Mahasabha. Officials in the government, including the Home Minister, defended the conversion programmes. Modi refused to remove a government minister from her position after a popular outcry resulted from her referring to religious minorities as "bastards." Commentators have suggested, however, that the violence was perpetrated by radical Hindu nationalists to undercut the authority of Modi. Between 2015 and 2018, Human Rights Watch estimated that 44 people, most of them Muslim, were killed by vigilantes; the killings were described by commentators as related to attempts by BJP state governments to ban the slaughter of cows. Links between the BJP and the RSS grew stronger under Modi. The RSS provided organizational support to the BJP's electoral campaigns, while the Modi administration appointed a number of individuals affiliated with the RSS to prominent government positions. In 2014, Yellapragada Sudershan Rao, who had previously been associated with the RSS, chairperson of the Indian Council of Historical Research (ICHR). Historians and former members of the ICHR, including those sympathetic to the BJP, questioned his credentials as a historian, and stated that the appointment was part of an agenda of cultural nationalism. Modi and US President Donald Trump giving a joint statement. Foreign policy played a relatively small role in Modi's election campaign, and did not feature prominently in the BJP's election manifesto. Modi invited all the other leaders of SAARC countries to his swearing in ceremony as prime minister. He was the first Indian prime minister to do so. Modi's foreign policy, similarly to that of the preceding INC government, focused on improving economic ties, security, and regional relations. Modi continued Manmohan Singh's policy of "multi-alignment." The Modi administration tried to attract foreign investment in the Indian economy from several sources, especially in East Asia, with the use of slogans such as "Make in India" and "Digital India". The government also tried to improve relations with Islamic nations in the Middle East, such as Bahrain, Iran, Saudi Arabia, and the United Arab Emirates, as well as with Israel. During the first few months after the election, Modi made trips to a number of different countries to further the goals of his policy, and attended the BRICS, ASEAN, and G20 summits. One of Modi's first visits as prime minister was to Nepal, during which he promised a billion USD in aid. Modi also made several overtures to the United States, including multiple visits to that country. While this was described as an unexpected development, due to the US having previously denied Modi a travel visa over his role during the 2002 Gujarat riots, it was also expected to strengthen diplomatic and trade relations between the two countries. In 2015, the Indian parliament ratified a land exchange deal with Bangladesh about the India–Bangladesh enclaves, which had been initiated by the government of Manmohan Singh. Modi's administration gave renewed attention to India's "Look East Policy", instituted in 1991. The policy was renamed the "Act East Policy", and involved directing Indian foreign policy towards East Asia and Southeast Asia. The government signed agreements to improve land connectivity with Myanmar, through the state of Manipur. This represented a break with India's historic engagement with Myanmar, which prioritised border security over trade. The President of Israel Reuven Rivlin and Chief of General Staff of the Israel Defense Forces Gadi Eizenkot with Modi. India's nominal military spending increased steadily under Modi. The military budget declined over Modi's tenure both as a fraction of GDP and when adjusted for inflation. A substantial portion of the military budget was devoted to personnel costs, leading commentators to write that the budget was constraining Indian military modernization. The BJP election manifesto had also promised to deal with illegal immigration into India in the Northeast, as well as to be more firm in its handling of insurgent groups. The Modi government issued a notification allowing Hindu, Sikh, and Buddhist illegal immigrants from Pakistan and Bangladesh to legalise their residency in India. The government described the measure as being taken for humanitarian reasons but it drew criticism from several Assamese organisations. The Modi administration negotiated a peace agreement with the largest faction of the National Socialist Council of Nagaland (NSCM), which was announced in August 2015. The Naga insurgency in northeast India had begun in the 1950s. The NSCM and the government had agreed to a ceasefire in 1997, but a peace accord had not previously been signed. In 2015 the government abrogated a 15-year ceasefire with the Khaplang faction of the NSCM (NSCM-K). The NSCM-K responded with a series of attacks, which killed 18 people. The Modi government carried out a raid across the border with Myanmar as a result, and labelled the NSCM-K a terrorist organisation. Modi promised to be "tough on Pakistan" during his election campaign, and repeatedly stated that Pakistan was an exporter of terrorism. On 29 September 2016, the Indian Army stated that it had conducted a surgical strike on terror launchpads in Azad Kashmir. The Indian media claimed that up to 50 terrorists and Pakistani soldiers had been killed in the strike. Pakistan initially denied that any strikes had taken place. Subsequent reports suggested that Indian claim about the scope of the strike and the number of casualties had been exaggerated, although cross-border strikes had been carried out. In February 2019 India carried out airstrikes in Pakistan against a supposed terrorist camp. Further military skirmishes followed, including cross-border shelling and the loss of an Indian aircraft. Modi (right) at CoP21 Climate Conference, in Paris, announcing the founding of an International Solar Alliance (ISA). November 2015. In naming his cabinet, Modi renamed the "Ministry of Environment and Forests" the "Ministry of Environment, Forests, and Climate Change." In the first budget of the government, the money allotted to this ministry was reduced by more than 50%. The new ministry also removed or diluted a number of laws related to environmental protection. These included no longer requiring clearance from the National Board for Wildlife for projects close to protected areas, and allowing certain projects to proceed before environmental clearance was received. The government also tried to reconstitute the Wildlife board such that it no longer had representatives from non-governmental organisations: however, this move was prevented by the Supreme Court. Modi also relaxed or abolished a number of other environmental regulations, particularly those related to industrial activity. A government committee stated that the existing system only served to create corruption, and that the government should instead rely on the owners of industries to voluntarily inform the government about the pollution they were creating. Other changes included reducing ministry oversight on small mining projects, and no longer requiring approval from tribal councils for projects inside forested areas. In addition, Modi lifted a moratorium on new industrial activity in the most polluted areas in the countries. The changes were welcomed by businesspeople, but criticised by environmentalists. Under the UPA government that preceded Modi's administration, field trials of Genetically Modified (GM) crops had essentially been put on hold, after protests from farmers fearing for their livelihoods. Under the Modi government these restrictions were gradually lifted. The government received some criticism for freezing the bank accounts of environmental group Greenpeace, citing financial irregularities, although a leaked government report said that the freeze had to do with Greenpeace's opposition to GM crops. In accordance with Ghanchi tradition, Modi's marriage was arranged by his parents when he was a child. He was engaged at age 13 to Jashodaben, marrying her when he was 18. They spent little time together and grew apart when Modi began two years of travel, including visits to Hindu ashrams. Reportedly, their marriage was never consummated, and he kept it a secret because otherwise he could not have become a 'pracharak' in the puritan Rashtriya Swayamsevak Sangh. Modi kept his marriage secret for most of his career. He acknowledged his wife for the first time when he filed his nomination for the 2014 general elections. Modi maintains a close relationship with his mother, Hiraben. A vegetarian and teetotaler, Modi has a frugal lifestyle and is a workaholic and introvert. Modi's 31 August 2012 post on Google Hangouts made him the first Indian politician to interact with citizens on a live chat. Modi has also been called a fashion-icon for his signature crisply ironed, half-sleeved kurta, as well as for a suit with his name embroidered repeatedly in the pinstripes that he wore during a state visit by US President Barack Obama, which drew public and media attention and criticism. Modi's personality has been variously described by scholars and biographers as energetic, arrogant, and charismatic. He had published a Gujarati book titled Jyotipunj in 2008, containing profiles of various RSS leaders. The longest was of M. S. Golwalkar, under whose leadership the RSS expanded and whom Modi refers to as Pujniya Shri Guruji ("Guru worthy of worship"). According to The Economic Times, his intention was to explain the workings of the RSS to his readers and to reassure RSS members that he remained ideologically aligned with them. Modi authored eight other books, mostly containing short stories for children. 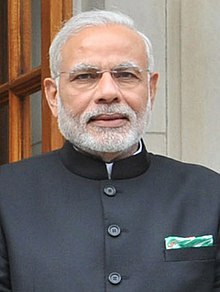 The nomination of Modi for the prime ministership drew attention to his reputation as "one of contemporary India's most controversial and divisive politicians." During the 2014 election campaign the BJP projected an image of Modi as a strong, masculine leader, who would be able to take difficult decisions. Campaigns in which he has participated have focused on Modi as an individual, in a manner unusual for the BJP and RSS. Modi has relied upon his reputation as a politician able to bring about economic growth and "development". Nonetheless, his role in the 2002 Gujarat riots continues to attract criticism and controversy. Modi's hardline Hindutva philosophy and the policies adopted by his government continue to draw criticism, and have been seen as evidence of a majoritarian and exclusionary social agenda. As a Prime Minister, Modi has received consistently high approval ratings; at the end of his first year in office, he received an overall approval rating of 87% in a Pew Research poll, with 68% of people rating him "very favorably" and 93% approving of his government. His approval rating remained largely consistent at around 74% through his second year in office, according to a nationwide poll conducted by instaVaani. At the end of his second year in office, an updated Pew Research poll showed Modi continued to receive high overall approval ratings of 81%, with 57% of those polled rating him "very favorably." At the end of his third year in office, a further Pew Research poll showed Modi with an overall approval rating of 88%, his highest yet, with 69% of people polled rating him "very favorably." A poll conducted by The Times of India in May 2017 showed 77% of the respondents rated Modi as "very good" and "good". In early 2017, a survey from Pew Research Center showed Modi to be the most popular figure in Indian politics. Modi was named the Best Chief Minister in a 2007 nationwide survey by India Today. In March 2012, he appeared on the cover of the Asian edition of Time Magazine, one of the few Indian politicians to have done so. He was awarded Indian of the Year by CNN-IBN news network in 2014. In 2014, 2015 and 2017, he was named one of Time magazine's 100 Most Influential People in the World. He was also declared winner of the Time magazine reader's poll for Person of the Year in 2014 and 2016. Forbes Magazine ranked him the 15th-Most-Powerful Person in the World in 2014 and the 9th-Most-Powerful Person in the World in 2015, 2016 and 2018. In 2015, Modi was ranked the 13th-Most-Influential Person in the World by Bloomberg Markets Magazine. Modi was ranked fifth on Fortune Magazine's first annual list of the "World's Greatest Leaders" in 2015. In 2017, Gallup International Association (GIA) conducted a poll and ranked Modi as third top leader of the world. In 2016, a wax statue of Modi was unveiled at Madame Tussaud Wax Museum in London. In 2015 he was named one of Time's "30 Most Influential People on the Internet" as the second-most-followed politician on Twitter and Facebook. In 2018 he was the third most followed head of the state on Twitter, and the most followed world leader on Facebook and Instagram. In October 2018, Modi received UN's highest environmental award, the 'Champions of the Earth', for policy leadership by “pioneering work in championing” the International Solar Alliance and “new areas of levels of cooperation on environmental action”. He was conferred the 2018 Seoul Peace Prize in recognition of his dedication to improving international cooperation, raising global economic growth, accelerating the Human Development of the people of India by fostering economic growth and furthering the development of democracy through anti-corruption and social integration efforts. He is the first Indian to win the award. In January 2019, PM Narendra Modi, a biographic film starring Vivek Oberoi as Modi, was announced. ^ Sources describing Modi's administration as complicit in the 2002 violence. ^ In 2012, a court stated that investigations had found no evidence against Modi. ^ Sources stating that Modi has failed to improve human development indices in Gujarat. ^ Sources discussing the controversy surrounding Modi. ^ The exact number of people killed in the train burning is variously reported. For example, the BBC says it was 59, while The Guardian put the figure at 60. ^ a b c d e f Nussbaum, Martha Craven (2008). The Clash Within: Democracy, Religious Violence, and India's Future. Harvard University Press. pp. 50–51. ISBN 978-0-674-03059-6. ^ a b c d Shani, Orrit (2007). Communalism, Caste and Hindu Nationalism. Cambridge University Press. pp. 168–173. ISBN 978-0-521-68369-2. ^ a b c d e Buncombe, Andrew (19 September 2011). "A rebirth dogged by controversy". The Independent. London. Archived from the original on 25 December 2011. Retrieved 10 October 2012. ^ a b c Jaffrelot, Christophe (June 2013). "Gujarat Elections: The Sub-Text of Modi's 'Hattrick'—High Tech Populism and the 'Neo-middle Class'". Studies in Indian Politics. 1 (1): 79–95. doi:10.1177/2321023013482789. Jaffrelot, Christophe (2013). "Gujarat Elections: The Sub-Text of Modi's 'Hattrick'—High Tech Populism and the 'Neo-middle Class'". Studies in Indian Politics. 1: 79–95. doi:10.1177/2321023013482789. Archived from the original on 23 October 2015. Retrieved 12 April 2014. ^ "India Gujarat Chief Minister Modi cleared in riots case". BBC News. BBC. 10 April 2012. Archived from the original on 20 December 2016. Retrieved 17 February 2017. ^ Dasgupta, Manas (10 April 2012). "SIT finds no proof against Modi, says court". The Hindu. Archived from the original on 21 December 2016. Retrieved 17 February 2017. ^ Joseph, Manu (15 February 2012). "Shaking Off the Horror of the Past in India". The New York Times. ISSN 0362-4331. Archived from the original on 12 March 2017. Retrieved 19 May 2017. ^ Mishra, Pankaj (April 2011). Visweswaran, Kamala, ed. Perspectives on Modern South Asia: A Reader in Culture, History, and Representation. Wiley-Blackwell. p. 188. ISBN 978-1-4051-0062-5. The chief minister of Gujarat, a young up-and-coming leader of the Hindu nationalists called Narendra Modi, quoted Isaac Newton to explain the killings of Muslims. "Every action", he said, "has an equal and opposite reaction." ^ a b c d e f Stepan, Alfred (January 2015). "India, Sri Lanka, and the Majoritarian Danger". Journal of Democracy. 26 (1): 128–140. doi:10.1353/jod.2015.0006. ^ a b c d e f Ganguly, Sumit (October 2014). "The Risks Ahead". Journal of Democracy. 25 (4): 56–60. doi:10.1353/jod.2014.0077. ^ "Indian PM Narendra Modi still mired in controversy, says expert". Canadian Broadcasting Corporation. 16 April 2015. Archived from the original on 14 October 2017. Retrieved 17 February 2017. ^ Nair, Rupam Jain (12 December 2007). "Edgy Indian state election going down to the wire". Reuters. Archived from the original on 16 October 2013. Retrieved 10 October 2012. ^ Robinson, Simon (11 December 2007). "India's Voters Torn Over Politician". Time Magazine. Archived from the original on 23 October 2013. Retrieved 10 October 2012. ^ Burke, Jason (28 March 2010). "Gujarat leader Narendra Modi grilled for 10 hours at massacre inquiry". The Guardian. Archived from the original on 9 September 2013. Retrieved 10 October 2012. ^ Marino 2014, pp. 13, 15, 29–30, 74. ^ "Narendra Modi belongs to Modh-Ghanchi caste, which was added to OBCs categories in 1994, says Gujarat government | Latest News & Updates at Daily News & Analysis". dna. 9 May 2014. Archived from the original on 4 December 2016. Retrieved 19 May 2017. ^ "PM Modi's brother asks Teli community to adopt 'Modi' prefix". The Indian Express. 20 November 2016. Archived from the original on 9 March 2017. Retrieved 19 May 2017. ^ "'Modi is a Teli-Ghanchi OBC': BJP – Times of India". The Times of India. Archived from the original on 2 October 2017. Retrieved 19 May 2017. ^ "'Modi is a Teli-Ghanchi OBC': BJP". The Times of India. 23 April 2014. Archived from the original on 6 December 2016. Retrieved 17 February 2017. ^ Ghai, Rajat (7 May 2014). "The office of Prime Minister: A largely north Indian upper-caste, Hindu affair". Business Standard India. Archived from the original on 19 June 2017. Retrieved 19 May 2017. ^ "'I have a special association with tea', Modi tells Lankan Tamils". www.oneindia.com. Archived from the original on 12 May 2017. Retrieved 19 May 2017. ^ a b c d e Jose, Vinod K. (1 March 2012). "The Emperor Uncrowned". The Caravan. pp. 2–4. Archived from the original on 11 November 2013. Retrieved 11 April 2013. ^ Marino 2014, p. 16. ^ Mukhopadhyay 2013, p. 82. ^ "Modi's life dominates publishing space (Election Special)". New Kerala. 14 March 2014. Archived from the original on 15 March 2014. Retrieved 4 April 2014. ^ Marino 2014, p. 24. ^ a b c Pathak, Anil (2 October 2001). "Modi's meteoric rise". The Times of India. Retrieved 11 April 2013. ^ Annie Gowen (January 25, 2015), Abandoned as a child bride, wife of Narendra Modi hopes he calls, The Washington Post Quote: "The wife, Jashodaben Chimanlal Modi, is a retired teacher who lives in a small town in Modi’s home state of Gujarat ... Narendra Modi, the son of a man who sold tea in a railway station, comes from a lower caste called Ghanchi. He and his wife were promised to each other as young adolescents in keeping with the traditions of their community. They were then married in a small ceremony when she was 17 and he was 18. " ^ Kai Shultz; Hari Kumar (February 7, 2018), Narendra Modi’s Estranged Wife Escapes Unhurt From Car Crash in India, The New York Times Quote: "The marriage, which was arranged, occurred about 50 years ago in a small town in Gujarat when Mr. Modi and Ms. Chimanlal were teenagers"
^ Annie Gowen (January 25, 2015), Abandoned as a child bride, wife of Narendra Modi hopes he calls, The Washington Post Quote: " Narendra Modi left shortly thereafter to wander in the Himalayas with little more than a change of clothing in his rucksack, ... Modi never returned to his wife but never divorced her, even as he became the high-profile chief minister of Gujarat and, last year, India’s premier. He never publicly spoke of his wife"
^ Kai Shultz; Hari Kumar (February 7, 2018), Narendra Modi’s Estranged Wife Escapes Unhurt From Car Crash in India, The New York Times Quote: "For most of his political career, Mr. Modi did not publicly acknowledge that he was married. He left his marital status blank on several election registration forms when he was chief minister of the state of Gujarat." ^ CNN Library (September 12, 2018), Narendra Modi: Fast Facts, CNN Quote: "Marriage: Jashodaben (Chimanlal) Modi (1968-present, separated); Entered into an arranged marriage as a teenager to Jashodaben Chimanlal. When he filed his nomination for prime minister, he was forced to acknowledge the marriage after almost 50 years of claiming to be single." ^ Marino 2014, p. 25. ^ Marino 2014, pp. 30–33. ^ Mukhopadhyay 2013, pp. 128–129. ^ "Narendra Modi invited to Ramakrishna Mission's headquarter in Belurmath". The Economic Times. 26 May 2014. Archived from the original on 31 October 2014. Retrieved 17 October 2014. ^ "The tale of two Narendras: Narendra Modi and Swami Vivekananda". The Statesman. 5 July 2016. Archived from the original on 18 February 2017. Retrieved 17 February 2017. ^ Marino 2014, p. 26. ^ Marino 2014, p. 27. ^ Marino 2014, pp. 28–29. ^ Mukhopadhyay 2013, p. 131. ^ a b Mukhopadhyay 2013, p. 138. ^ Unnithan, Sandeep (2014). "The man behind Modi: Lakshmanrao Inamdar". India Today. Ahmedabad. Archived from the original on 21 May 2014. Retrieved 22 May 2014. ^ Mukhopadhyay, Nilanjan (2014). "Narendra Modi: The making of the political leader". Archived from the original on 17 May 2014. Retrieved 22 May 2014. ^ Marino 2014, p. 35. ^ a b Marino 2014, pp. 35–40. ^ Goyal, Prateek (18 May 2014). "Mentoring Modi". Pune Mirror. Archived from the original on 21 June 2015. Retrieved 21 June 2015. ^ "Narendra Modi degree row: DU college says it has no data of students passing out in 1978". India Today. Archived from the original on 17 March 2017. Retrieved 9 June 2017. ^ a b "Narendra Modi: From tea vendor to PM candidate". India Today. 13 September 2013. Archived from the original on 21 April 2014. Retrieved 20 April 2014. ^ Marino 2014, p. 48. ^ "Narendra Modi's degree 'authentic': Delhi University Registrar Tarun Das". The Hindu. Archived from the original on 14 November 2017. Retrieved 9 June 2017. ^ Avasthi, Yogesh (10 May 2016). "Globetrotting PM Modi was weakest in 'International Relations'". The Economic Times. Archived from the original on 29 July 2017. Retrieved 17 February 2017. ^ "Modi proves to be an astute strategist". Hindustan Times. 23 December 2007. Archived from the original on 19 August 2014. Retrieved 17 April 2014. ^ "Degree row- PM Modi MA with first class: Gujarat University". The Indian Express. May 2016. Archived from the original on 29 July 2017. Retrieved 29 July 2017. ^ Guha 2008, p. 493–494. ^ Kochanek & Hardgrave 2007, p. 205. ^ Marino 2014, pp. 36–40. ^ Marino 2014, p. 43. ^ Mukhopadhyay 2013, p. 150. ^ a b Marino 2014, pp. 38–43. ^ Patel, Aakar. "The poetic side of Narendra Modi". Deccan Chronicle. Archived from the original on 24 May 2014. Retrieved 23 May 2014. ^ "Gujarat not enamoured by poet Narendra Modi". The Times of India. 28 June 2004. Archived from the original on 23 October 2015. Retrieved 17 October 2014. ^ Marino 2014, pp. 38–43, 46–50. ^ Marino 2014, pp. 45–48. ^ Marino 2014, pp. 54–57. ^ Marino 2014, pp. 56–59. ^ Mukhopadhyay 2013, pp. 68–69. ^ a b c Marino 2014, pp. 60–63. ^ a b c d Venkatesan, V. (2001) [13–26 October 2001]. "A pracharak as Chief Minister". Frontline (magazine). New Delhi. Archived from the original on 5 April 2013. Retrieved 11 April 2013. ^ "Gujarat Assembly Elections 2012: Narendra Modi profile". Zee News. Gujarat. Archived from the original on 20 April 2013. Retrieved 6 April 2013. ^ Mehta, Harit (1 April 2014). "Six-year banishment led to Narendra Modi's metamorphosis". The Times of India. Archived from the original on 1 April 2014. Retrieved 2 April 2014. ^ Marino 2014, p. 78. ^ Marino 2014, p. 79. ^ a b c d Phadnis, Aditi (2009). Business Standard Political Profiles of Cabals and Kings. Business Standard Books. pp. 116–21. ISBN 978-81-905735-4-2. Archived from the original on 3 January 2014. ^ Bunsha, Dionne (13 October 2001). "A new oarsman". Frontline. Archived from the original on 28 August 2006. Retrieved 11 April 2013. ^ "Narendra Modi – Leading the race to 7 RCR". Zee News. 8 April 2014. Archived from the original on 24 August 2014. Retrieved 15 August 2014. ^ Dasgupta, Manas (7 October 2001). "Modi sworn in Gujarat CM amidst fanfare". The Hindu. Archived from the original on 11 October 2014. Retrieved 11 October 2014. ^ Venkatesan, V. "A victory and many pointers". Frontline. Archived from the original on 23 October 2015. Retrieved 11 October 2014. ^ "Eleven sentenced to death for India Godhra train blaze". BBC News. 1 March 2011. Archived from the original on 24 June 2014. Retrieved 10 March 2014. ^ Burke, Jason (22 February 2011). "Godhra train fire verdict prompts tight security measures". The Guardian. Archived from the original on 23 October 2013. Retrieved 10 March 2014. ^ a b c d e Jaffrelot, Christophe (July 2003). "Communal Riots in Gujarat: The State at Risk?". Heidelberg Papers in South Asian and Comparative Politics. doi:10.11588/heidok.00004127. Archived from the original on 7 June 2007. Retrieved 17 February 2017. ^ "Gujarat riot death toll revealed". BBC News. 11 May 2005. Archived from the original on 26 February 2009. Retrieved 17 February 2017. ^ a b Murphy, Eamon (2010). "'We have no orders to save you': state terrorism, politics and communal violence in the Indian state of Gujarat, 2002". In Jackson, Richard; Murphy, Eamon Murphy; Poynting, Scott. Contemporary State Terrorism. New York, New York, USA: Routledge. pp. 84–103. ISBN 978-0-415-49801-2. ^ a b c "Army too helpless as violence mounts". The Economic Times. 1 March 2002. Archived from the original on 4 January 2013. Retrieved 17 April 2014. ^ a b c "Curfew imposed in 26 cities". The Hindu. Chennai, India. 1 March 2002. Archived from the original on 3 March 2015. Retrieved 17 April 2014. ^ "Decision to bring Godhra victims' bodies taken at top level". The Hindu. Chennai, India. 10 February 2012. Archived from the original on 12 February 2013. Retrieved 12 April 2013. ^ "Gujarat Riot Death Toll revealed". BBC News. 11 May 2005. Archived from the original on 26 February 2009. Retrieved 14 November 2013. ^ Campbell, John; Seiple, Chris; Hoover, Dennis R.; et al., eds. (2012). The Routledge Handbook of Religion and Security. Routledge. p. 233. ISBN 978-0-415-66744-9. ^ Brass, Paul R. (15 July 2005). The Production of Hindu-Muslim Violence in Contemporary India. University of Washington Press. p. 388. ISBN 978-0-295-98506-0. ^ a b Sengupta, Somini (28 April 2009). "Shadows of Violence Cling to Indian Politician". The New York Times. Archived from the original on 30 August 2012. Retrieved 12 May 2013. ^ Ogden, Chris (2012). "A Lasting Legacy: The BJP-led National Democratic Alliance and India's Politics". Journal of Contemporary Asia. 42 (1): 22–38. doi:10.1080/00472336.2012.634639. ^ Pandey, Gyanendra (November 2005). Routine violence: nations, fragments, histories. Stanford University Press. pp. 187–188. ISBN 978-0-8047-5264-0. ^ Baruah, Bipasha (2012). Women and Property in Urban India. University of British Columbia Press. p. 41. ISBN 978-0-7748-1928-2. ^ Hampton, Janie (2002). Internally Displaced People: A Global Survey. Routledge. p. 116. ISBN 978-1-85383-952-8. ^ a b c d e f Christophe, Jaffrelot (2015). "What 'Gujarat Model'?—Growth without Development— and with Socio-Political Polarisation". South Asia: Journal of South Asian Studies. 38 (4): 820–838. doi:10.1080/00856401.2015.1087456. ^ Jaffrelot, Christophe (25 February 2012). "Gujarat 2002: What Justice for the Victims?". Economic & Political Weekly. 47 (8). ^ Soni, Nikunj (21 February 2012). "For Maya Kodnani, riots memories turn her smile into gloom". DNA India. Archived from the original on 2 September 2012. Retrieved 7 June 2012. ^ "Maya Kodnani led mob to carry out Naroda riot: Gujarat govt to HC". The Economic Times. 21 February 2009. Archived from the original on 11 November 2013. Retrieved 7 June 2012. ^ "Narendra Modi government now rethinks death penalty for ex-aide Maya Kodnani". NDTV. 14 May 2013. Archived from the original on 12 November 2013. Retrieved 18 September 2013. ^ "Modi gets cold feet on death for Kodnani". Hindustan Times. 14 May 2013. Archived from the original on 14 November 2013. Retrieved 18 September 2013. ^ "Gujarat HC on Naroda Patiya: SIT probe doesn't 'inspire much confidence'". Press Trust of India. 22 April 2018. Archived from the original on 22 April 2018. Retrieved 22 April 2018. ^ Barry, Ellen (7 April 2014). "Wish for Change Animates Voters in India Election". The New York Times. Archived from the original on 27 May 2014. Retrieved 30 May 2014. ^ "Narendra Modi rules out apology for 2002 Gujarat riots". Archived from the original on 18 January 2018. Retrieved 26 November 2017. ^ a b c "Timeline: Zakia Jafri vs Modi in 2002 Gujarat riots case". Hindustan Times. 26 December 2013. Archived from the original on 19 March 2014. Retrieved 23 May 2014. ^ "National Human Rights Commission vs. State of Gujarat & Ors. – Writ Petition (Crl.) No. 109/2003". Supreme Court of India. Archived from the original on 23 May 2014. Retrieved 23 May 2014. ^ Mahapatra, Dhananjay (3 December 2010). "SIT clears Narendra Modi of willfully allowing post-Godhra riots". The Times of India. Archived from the original on 8 July 2014. Retrieved 17 April 2014. ^ "Proceed against Modi for Gujarat riots: amicus". The Hindu. Chennai, India. 9 May 2012. Archived from the original on 5 July 2014. Retrieved 17 April 2014. ^ Dasgupta, Manas (10 May 2012). "SIT rejects amicus curiae's observations against Modi". The Hindu. Chennai, India. Archived from the original on 5 July 2014. Retrieved 17 April 2014. ^ Khan, Saeed; Kaushik, Humanshu (26 December 2013). "2002 Gujarat riots: Clean chit to Modi, court rejects Zakia Jafri's plea". The Times of India. Archived from the original on 4 October 2014. Retrieved 4 June 2014. ^ "Congress demands Modi's resignation over Bannerjee report". Rediff.com. 3 March 2006. Archived from the original on 6 January 2008. Retrieved 17 November 2007. ^ "BJP national exec rejects Modi's resignation". Rediff.com. 12 April 2002. Archived from the original on 3 March 2014. Retrieved 22 April 2014. ^ "Gujarat Assembly dissolved, early poll sought". The Economic Times. 19 July 2002. Archived from the original on 20 December 2013. Retrieved 17 April 2014. ^ "Modi resigns; seeks Assembly dissolution". The Hindu. 19 July 2002. Archived from the original on 25 January 2005. Retrieved 9 May 2006. ^ a b c Jaffrelot, Christophe (2015). "Narendra Modi and the Power of Television in Gujarat". Television & New Media. 16 (4): 346–353. doi:10.1177/1527476415575499. ^ "Statistical Report on General Election, 2002 to the Legislative Assembly of Gujarat" (PDF). New Delhi: Election Commission of India. p. 228. Archived (PDF) from the original on 17 January 2012. Retrieved 12 April 2013. ^ a b c d e f g h Jaffrelot, Christophe (9 May 2016). "Narendra Modi between Hindutva and subnationalism: The Gujarati asmita of a Hindu Hriday Samrat". India Review. 15 (2): 196–217. doi:10.1080/14736489.2016.1165557. ^ Brasted, Howard V. (2005). Lahoud, Nelly; Johns, A. H., eds. Islam in World Politics. Routledge. p. 119. ISBN 978-0-415-32411-3. the successful anti-Muslim campaign run in Gujarat in December 2002 by its provincial chief minister Narendra Modi – a hardline Hindu nationalist preacher turned politician – has ominous implications. ^ "Modi wins Maninagar seat by 75,333 votes". Times of India. TNN. 15 December 2002. Archived from the original on 23 October 2015. Retrieved 16 October 2014. ^ "Narendra Modi sworn in as Gujarat CM". Rediff. 22 December 2002. Archived from the original on 24 September 2015. Retrieved 16 October 2014. ^ a b c Umat, Ajay (9 February 2013). "Once Hindutva twins, Narendra Modi and PravinTogadia no longer conjoined". The Times of India. Archived from the original on 23 October 2015. Retrieved 11 April 2013. ^ "Religious leaders demand rebuilding of temples". DNA India. Press Trust of India. 25 November 2008. Archived from the original on 11 November 2013. Retrieved 12 April 2013. ^ "Test-Tubes in Hastinapur". Outlook India. 22 September 2014. Archived from the original on 3 October 2014. Retrieved 28 September 2014. ^ a b c d e f g h i j k l m Manor, James (2015). "A Precarious Enterprise? Multiple Antagonisms during Year One of the Modi Government". South Asia: Journal of South Asian Studies. 38 (4): 736–754. doi:10.1080/00856401.2015.1083644. ^ Dasgupta, Manas (4 April 2002). "Vajpayee's advice to Modi". The Hindu. Chennai, India. Archived from the original on 23 October 2015. Retrieved 2 April 2013. ^ "Vajpayee, Advani differed over Modi's resignation". India Today. 20 March 2008. Archived from the original on 11 November 2013. Retrieved 2 April 2013. ^ Tellis, Ashley J.; Wills, Michael (September 2007). Domestic political change and grand strategy. National Bureau of Asian Research. pp. 193–4. ISBN 978-0-9713938-8-2. Archived from the original on 6 January 2016. ^ Yogendra, Kanwar (13 June 2004). "Not removing Modi was a mistake, says Vajpayee". The Hindu. Chennai, India. Archived from the original on 23 October 2015. Retrieved 2 April 2013. ^ "Why Narendra Modi Was Banned From the U.S.". Wall Street Journal. 2 May 2014. ^ "No entry for Modi into US: visa denied". The Times of India. 18 March 2005. Archived from the original on 13 September 2014. Retrieved 15 August 2014. ^ Mann, James (2 May 2014). "Why Narendra Modi Was Banned From the U.S." The Wall Street Journal. Archived from the original on 15 December 2014. Retrieved 3 June 2014. ^ Burke, Jason (22 October 2012). "UK government ends boycott of Narendra Modi". The Guardian. Archived from the original on 14 September 2013. Retrieved 12 May 2013. ^ "Germany delinks Narendra Modi's image from human rights issues". NDTV. 6 March 2013. Archived from the original on 8 March 2013. Retrieved 6 March 2013. ^ "Readout of the President's Call with Prime Ministerial Candidate Narendra Modi of India". Whitehouse.gov. 16 May 2014. Archived from the original on 22 May 2014. Retrieved 14 June 2014. ^ Cassidy, John (16 May 2014). "What Does Modi's Victory Mean for the World?". The New Yorker. Archived from the original on 24 September 2014. Retrieved 21 May 2014. ^ Naqvi, Saba (22 December 2008). "When fear didn't enter the booth". Outlook India. pp. 26–28. Archived from the original on 3 January 2014. Retrieved 11 April 2013. ^ "Mahatma on lips, Modi fights Centre". The Telegraph. Kolkata, India. 19 July 2006. Archived from the original on 11 June 2008. Retrieved 9 May 2008. ^ Shah, Rajiv (24 November 2007). "'Karmayogi' swears by caste order 'Scavenging A Spiritual Experience For Valmiks'". Times of India. Archived from the original on 8 February 2017. Retrieved 17 February 2017. ^ "Narendra Modi is 'anti-Dalit': Congress". DNA. 23 April 2014. Archived from the original on 15 February 2017. Retrieved 17 February 2017. ^ Gupta, Smita (15 April 2014). "Modi against dalits". The Hindu. Archived from the original on 7 June 2014. Retrieved 17 February 2017. ^ "Modi wants 3-layer ring to secure coast". The Times of India. 28 November 2008. Archived from the original on 23 July 2013. Retrieved 17 September 2011. ^ "Narendra Modi wins Maninagar by 70,000 votes". Hindustan Times. 20 December 2012. Archived from the original on 7 December 2013. Retrieved 17 April 2014. ^ "BJP adds 5 seats in Gujarat Assembly by-polls". Deccan Herald. 14 September 2009. Archived from the original on 16 May 2013. Retrieved 17 September 2011. ^ a b c d Shah, Tushaar (2011). Business Standard India 2011. Business Standard Books. pp. 195–199. ISBN 978-93-80740-04-1. Archived from the original on 6 January 2016. ^ Mahurkar, Uday (4 June 2010). "A green rising". India Today. Archived from the original on 11 April 2013. Retrieved 12 April 2013. ^ a b "Gujarat, Maharashtra record highest growth in farm sector". The Hindu. 12 July 2012. Archived from the original on 1 August 2013. Retrieved 12 April 2013. ^ a b Mishra, Mayank (20 July 2013). "Did Narendra Modi make Gujarat Vibrant?". Business Standard. Archived from the original on 20 April 2014. Retrieved 29 April 2014. ^ a b c Schöttli, Jivanta; Pauli, Markus (2016). "Modi-nomics and the politics of institutional change in the Indian economy". Journal of Asian Public Policy. 9 (2): 154–169. doi:10.1080/17516234.2016.1165332. ^ Shah, Tushar; Verma, Shilp (22 February 2008). "Co-Management of Electricity and Groundwater: An Assessment of Gujarat's Jyotirgram Scheme". Economic and Political Weekly. 43 (7): 59–66. JSTOR 40277613. ^ a b c d e f g h i j Basu, Dipankar; Misra, Kartik (June 2014). "BJP's Demographic Dividend in the 2014 General Elections: An Empirical Analysis". Economics Department Working Paper Series. ^ Ghatak, Maitreesh; Roy, Sanchari (12 April 2014). "Did Gujarat's Growth Rate Accelerate under Modi?". Economic and Political Weekly. 49 (15): 12–15. ^ Limited, Times Internet (15 September 2015). "Gujarat tops ease of doing business ranking among states – The Economic Times on Mobile". Archived from the original on 10 January 2018. Retrieved 16 September 2015. ^ "Gujarat tops list of economically-free states". hindustantimes.com/. 19 March 2014. Retrieved 16 September 2015. ^ a b c Hariss, John (2015). "Hindu Nationalism in Action: The Bharatiya Janata Party and Indian Politics". South Asia: Journal of South Asian Studies. 38 (4): 711–718. doi:10.1080/00856401.2015.1089826. ^ a b "Sparing Mr Modi's blushes". 27 June 2015. Archived from the original on 30 January 2017. Retrieved 9 November 2016. ^ "Big win for Narendra Modi, defeats Shweta Bhatt by huge margin". NDTV. Press Trust of India. 20 December 2012. ^ Ghassem-fachandi, Parvis (2012). Pogrom in Gujarat: Hindu Nationalism and Anti-Muslim Violence in India. Princeton University Press. p. 198. ISBN 978-0-691-15177-9. Archived from the original on 6 January 2016. ^ 1. "Action continues: Narendra Modi makes lotus bloom again in Gujarat". DNA India. 20 December 2012. Archived from the original on 23 December 2012. Retrieved 17 April 2014. 2. "Gujarat results 2012 Live :Modi's claim for PM's post gets stronger". Samay Live. 20 December 2012. Archived from the original on 2 January 2015. Retrieved 21 December 2012. ^ Gupta, Smita (6 June 2013). "BJP sweeps Gujarat bypolls, RJD trumps JD(U) in Bihar". The Hindu. Chennai, India. Archived from the original on 4 May 2014. Retrieved 17 April 2014. ^ Bhowmick, Nilanjana (5 March 2013). "Why Wharton Canceled Narendra Modi's Speech". Time. Archived from the original on 23 May 2014. Retrieved 23 May 2014. ^ "Anandiben Patel named new Gujarat chief minister". India Today. 21 May 2014. Archived from the original on 6 October 2014. Retrieved 1 October 2014. ^ a b c Chhibber, Pradeep K.; Ostermann, Susan L. (2014). "The BJP's Fragile Mandate: Modi and Vote Mobilizers in the 2014 General Elections". Studies in Indian Politics. 2 (2): 137–151. doi:10.1177/2321023014551870. ^ Reddy, B. Muralidhar (14 September 2013). "BJP announces Modi as prime ministerial candidate". The Hindu. Chennai, India. Archived from the original on 17 October 2013. ^ a b c d e f g h i j Jaffrelot, Christophe (2015). "The Modi-centric BJP 2014 election campaign: new techniques and old tactics". Contemporary South Asia. 23 (2): 151–166. doi:10.1080/09584935.2015.1027662. ^ "Advani grabs lifeline, meekly withdraws resignation". The Times of India. 12 June 2013. Archived from the original on 13 October 2014. Retrieved 15 August 2013. ^ Srivastava, Ritesh (30 August 2011). "Election 2009 dissected: How parties cut the vote pie". Zee News. Archived from the original on 6 June 2014. Retrieved 4 June 2014. ^ a b c Chakravartty, Paula; Roy, Srirupa (2015). "Mr. Modi Goes to Delhi: Mediated Populism and the 2014 Indian Elections". Television & New Media. 16 (4): 311–322. doi:10.1177/1527476415573957. ^ a b c d e f g Chacko, Priya; Mayer, Peter. "The 'Modi lahar [wave]' in the 2014 Indian national election: A critical realignment?". Australian Journal of Political Science. 49 (3). ^ a b Srivastava, Sanjay (April 2015). "Modi-Masculinity". Television & New Media. 16 (4): 331–338. doi:10.1177/1527476415575498. ^ Narayan, Badri (17 May 2014). "Modi's Modus Operandi in the 2014 Elections". Economic & Political Weekly. 49 (20): 12–14. ^ Palshikar, S.; Suri, K. C. (2014). "India's 2014 Lok Sabha elections: Critical shifts in the long term, caution in the short term". Economic and Political Weekly. 49: 39–76. ^ Sridharan, Eswaran (October 2014). "Behind Modi's Victory". Journal of Democracy. 25 (4): 56–60. doi:10.1353/jod.2014.0077. ^ Kaur, Ravinder (2015). "Good Times, Brought to you by Brand Modi" (PDF). Television & New Media (Submitted manuscript). 16 (4): 323–330. doi:10.1177/1527476415575492. ^ "Narendra Modi files nomination in Vadodara after grand roadshow". NDTV. 9 April 2014. Archived from the original on 16 April 2014. Retrieved 17 April 2014. ^ "Modi's Vadodara victory margin not highest-ever". Business Standard. 16 May 2014. Archived from the original on 12 April 2017. Retrieved 17 February 2017. ^ "President appoints Narendra Modi as Prime Minister, Oath taking ceremony on May 26". Office of President of India. 20 May 2014. Archived from the original on 21 May 2014. Retrieved 26 May 2014. ^ "Narendra Modi appointed PM, swearing-in on May 26". The Indian Express. Press Trust of India. 20 May 2014. Archived from the original on 20 May 2014. Retrieved 26 May 2014. ^ "Modi thanks Vadodara, looks forward to serve Ganga". Hindustan Times. Press Trust of India. 29 May 2014. Archived from the original on 29 May 2014. Retrieved 29 May 2014. ^ "Narendra Modi appointed Prime Minister, swearing in on May 26". The Times of India. 20 May 2014. Archived from the original on 20 May 2014. Retrieved 21 May 2014. ^ Wyatt, Andrew (2015). "India in 2014" (PDF). Asian Survey. 55 (1): 33–47. doi:10.1525/AS.2015.55.1.33. ^ a b c d e Sen, Ronojoy (2015). "House Matters: The BJP, Modi and Parliament". Journal of South Asian Studies. 38 (4): 776–790. doi:10.1080/00856401.2015.1091200. ^ a b "Modi replaces Planning Commission, aiming to boost growth". Reuters. 1 January 2015. Archived from the original on 23 October 2015. Retrieved 17 February 2017. ^ a b c Sengupta, Mitu (2015). "Modi Planning: What the NITI Aayog Suggests about the Aspirations and Practices of the Modi Government". Journal of South Asian Studies. 38 (4): 791–806. doi:10.1080/00856401.2015.1088609. ^ a b c d e f g h i j k l m Ruparelia, Sanjay (2015). "'Minimum Government, Maximum Governance': The Restructuring of Power in Modi's India". Journal of South Asian Studies. 38 (4): 755–775. doi:10.1080/00856401.2015.1089974. ^ Patnaik, Prabhat (24 January 2015). "From the Planning Commission to the NITI Aayog". Economic & Political Weekly. 50 (4). ^ a b c Shah, Alpa; Lerche, Jens (10 October 2015). "India's Democracy: Illusion of Inclusion". Economic & Political Weekly. 50 (41): 33–36. ^ "Cabinet approves raising FDI cap in defence to 49 percent, opens up railways". The Times Of India. 7 August 2014. Archived from the original on 7 August 2015. Retrieved 27 July 2015. ^ Zhong, Raymond (20 November 2014). "Modi Presses Reform for India—But Is it Enough?". The Wall Street Journal. Archived from the original on 29 March 2016. ^ "Modi renews labour reforms push as jobs regain focus before polls". Economic Times. 14 March 2018. Retrieved 6 February 2019. ^ Rahul Shrivastava (18 October 2014). "Narendra Modi Government Deregulates Diesel Prices". NDTV. Archived from the original on 29 November 2016. Retrieved 17 February 2017. ^ "Look East, Link West, says PM Modi at Make in India launch". Hindustan Times. 25 September 2014. Archived from the original on 17 August 2015. Retrieved 17 February 2017. ^ Guha, Abhijit (2015). "Dangers of Indian Reform of the Colonial Land Acquisition Law". Global Journal of Human-Social Science. 15 (1). ^ "Rs 500, Rs 1000 currency notes stand abolished from midnight: PM Modi". The Indian Express. 9 November 2016. Archived from the original on 15 February 2017. Retrieved 17 February 2017. ^ "Demonetisation: Chaos grows, queues get longer at banks, ATMs on weekend". 12 November 2016. Archived from the original on 4 February 2017. Retrieved 17 February 2017. ^ "India demonetisation: Chaos as ATMs run dry". Al Jazeera. Archived from the original on 10 November 2016. Retrieved 9 November 2016. ^ "Queues get longer at banks, ATMs on weekend". The Hindu. 12 November 2016. Retrieved 17 February 2017. ^ Rukhaiyar, Ashish (9 November 2016). "Sensex crashes 1,689 points on black money crackdown, U.S. election". The Hindu. The Hindu. Archived from the original on 9 November 2016. Retrieved 9 November 2016. ^ "Thousands Protest Across India Against Currency Policy". New York Times. 28 November 2016. Archived from the original on 1 December 2016. Retrieved 4 December 2016. ^ "India: Demonetisation takes its toll on the poor". Al Jazeera. 16 November 2016. Archived from the original on 17 November 2016. Retrieved 17 November 2016. ^ "Demonetisation Death Toll Rises To 25 And It's Only Been 6 Days". huffingtonpost. Archived from the original on 16 November 2016. Retrieved 15 November 2016. ^ "Budget 2019: Who gave India a higher GDP - Modi or Manmohan?". Business Times. 1 February 2019. Retrieved 6 February 2019. ^ V., Harini (14 November 2018). "India's economy is booming. Now comes the hard part". CNBC. Retrieved 6 February 2019. ^ Gettleman, Jeffrey; Kumar, Hari (31 January 2019). "India's Leader Is Accused of Hiding Unemployment Data Before Vote". New York Times. Retrieved 7 February 2019. ^ Kumar, Manoj; Ghoshal, Devjyot. "Indian jobless rate at multi-decade high, report says, in blow to Modi". Reuters. Retrieved 7 February 2019. ^ a b c Sharma, Dinesh C (May 2015). "India's BJP Government and health: 1 year on". The Lancet. 385 (9982): 2031–2032. doi:10.1016/S0140-6736(15)60977-1. PMID 26009217. ^ Bagcchi, Sanjeet (2 January 2015). "India cuts health budget by 20%". BMJ. 350. ISSN 1756-1833. ^ Karla, Aditya (23 December 2014). "Govt to cut health budget by nearly 20 per cent for 2014-15". www.businesstoday.in. Business Today. Reuters. Archived from the original on 28 April 2018. Retrieved 27 April 2018. ^ "Budget 2015 disappointed healthcare sector". The Economic Times. 15 March 2015. Archived from the original on 21 April 2018. Retrieved 21 April 2018. ^ Mudur, Ganapati (2016). "Rise in India's health budget is "disappointing," say experts". BMJ: British Medical Journal (Online). 352. Retrieved 24 April 2018. ^ "Budget 2018 boost for healthcare: Lessons for 'Modicare' from Obamacare - Times of India". The Times of India. Archived from the original on 9 April 2018. Retrieved 21 April 2018. ^ "85 pc pictorial warning on tobacco products in force from today". Hindustan Times. 1 April 2016. Archived from the original on 2 February 2017. Retrieved 27 January 2017. ^ Schmidt, Charles W. (November 2014). "Beyond Malnutrition". Environmental Health Perspectives. 122 (11): A298–303. doi:10.1289/ehp.122-a298. PMC 4216152. PMID 25360801. ^ a b Jeffrey, Robin (2015). "Clean India! Symbols, Policies and Tensions". South Asia: Journal of South Asian Studies. 38 (4): 807–819. doi:10.1080/00856401.2015.1088504. ^ a b Lakshmi, Rama (14 December 2012). "India is building millions of toilets, but that's the easy part". The Washington Post. Archived from the original on 4 October 2015. Retrieved 3 October 2015. ^ a b Gahlot, Mandakini (3 April 2015). "India steps up efforts to encourage use of toilets". USA Today. Archived from the original on 16 August 2017. Retrieved 17 February 2017. ^ "The Final Frontier". The Economist. 19 July 2014. Archived from the original on 6 February 2017. Retrieved 17 February 2017. ^ Chaudhary, Archana (18 May 2015). "India Plans .3-Billion Sewage Plants in Towns Along the Ganges". Bloomberg. Archived from the original on 29 July 2016. ^ a b c d Palshikar, Suhas (2015). "The BJP and Hindu Nationalism: Centrist Politics and Majoritarian Impulses". Journal of South Asian Studies. 38 (4): 719–735. doi:10.1080/00856401.2015.1089460. ^ a b "Narendra Modi and the struggle for India's soul". The Economist. 2 March 2019. Retrieved 27 March 2019. ^ "Choice of ICHR chief reignites saffronisation debate". The Hindu. 16 July 2014. Archived from the original on 2 December 2014. Retrieved 20 August 2014. ^ "Right-wingers question ICHR chief selection". The Times of India. 18 July 2014. Archived from the original on 21 July 2014. Retrieved 20 August 2014. ^ a b c Hall, Ian (2015). "Is a 'Modi doctrine' emerging in Indian foreign policy?". Australian Journal of International Affairs. 69 (3): 247–252. doi:10.1080/10357718.2014.1000263. ^ Grare, Frederic (Winter 2015). "India–Pakistan Relations: Does Modi Matter?". The Washington Quarterly. 37 (4): 101–114. doi:10.1080/0163660X.2014.1002158. ^ a b c Pant, Harsh V. (Fall 2014). "Modi's Unexpected Boost to India-U.S. Relations". The Washington Quarterly. 37 (3): 97–112. doi:10.1080/0163660X.2014.978438. ^ Swami, Praveen (22 May 2014). "In a first, Modi invites SAARC leaders for his swearing-in". The Hindu. Chennai, India. Archived from the original on 25 May 2014. Retrieved 24 May 2014. ^ a b c d Hall, Ian (2016). "Multialignment and Indian Foreign Policy under Narendra Modi". The Round Table. 105 (3): 271–286. doi:10.1080/00358533.2016.1180760. ^ Mocko, Anne; Penjore, Dorji (2015). "Nepal and Bhutan in 2014". Asian Survey. 55 (1): 75–81. doi:10.1525/AS.2015.55.1.75. ^ a b Downie, Edmund (25 February 2015). "Manipur and India's 'Act East' Policy". The Diplomat. ^ Manghat, Sajeet (1 February 2019). "Budget 2019: A 10 Percent Hike In Defence Capital Outlay". Bloomberg Quint. Retrieved 8 April 2019. ^ a b Rajagopalan, Rajeswari Pillai (9 February 2019). "Why India's New Defense Budget Falls Short". The Diplomat. Retrieved 8 April 2019. ^ a b "India spends a fortune on defence and gets poor value for money". The Economist. 28 March 2018. Retrieved 8 April 2019. ^ Sharma, Kiran (17 February 2019). "India's arms modernization hampered by populist budget". Nikkei Asian Review. Retrieved 8 April 2019. ^ a b c d Singh, Amarjeet (2016). "Narendra Modi and Northeast India: development, insurgency and illegal migration". Journal of Asian Public Policy. 9 (2): 112–127. doi:10.1080/17516234.2016.1165313. ^ a b Sinha, Amitabh; Swami, Praveen (4 August 2015). "Towards the Govt-Naga peace accord: Everything you need to know". The Indian Express. Archived from the original on 28 November 2016. Retrieved 30 November 2016. ^ a b "Reversing roles". The Economist. 6 October 2016. Retrieved 8 April 2019. ^ "PM slams Pakistan on terror: 10 quotes from Narendra Modi's speech in Kozhikode". The Indian Express. 24 September 2016. Archived from the original on 19 November 2016. Retrieved 17 February 2017. ^ "One nation in South Asia spreading terrorism: PM Modi at G20 Summit". The Times of India. 5 September 2016. Archived from the original on 10 March 2017. Retrieved 17 February 2017. ^ "India's surgical strikes across LoC: Full statement by DGMO Lt Gen Ranbir Singh". Hindustan Times. 29 September 2016. Archived from the original on 2 October 2016. Retrieved 2 October 2016. ^ "Uri avenged: 35–40 terrorists, 9 Pakistani soldiers killed in Indian surgical strikes". 29 September 2016. Archived from the original on 2 October 2016. ^ "Surgical strikes in PoK: How Indian para commandos killed 50 terrorists, hit 7 camps". India Today. 29 September 2016. Archived from the original on 1 October 2016. Retrieved 1 October 2016. ^ Ellen Barry; Salman Masood (29 September 2016). "India Claims 'Surgical Strikes' in Pakistani-Controlled Kashmir". The New York Times. Archived from the original on 2 October 2016. Retrieved 1 October 2016. ^ "Balakot: Pakistan vows to respond after Indian 'air strikes'". BBC. 26 February 2019. Retrieved 8 April 2019. ^ "Skirmishing between India and Pakistan could escalate". The Economist. 28 February 2019. Retrieved 8 April 2019. ^ a b c d e Kothari, Ashish (27 September 2014). "A Hundred Days Closer to Ecological and Social Suicide". Economic & Political Weekly. 49 (39). ^ a b c Barry, Ellen; Bagri, Neha Thirani (4 December 2014). "Narendra Modi, Favoring Growth in India, Pares Back Environmental Rules". The New York Times. ^ a b c Kumar, Sanjay (14 May 2015). "India eases stance on GM crop trials". Nature. 521 (7551): 138–139. Bibcode:2015Natur.521..138K. doi:10.1038/521138a. ^ "Narendra Modi's 'wife' Jashodaben finally speaks, 'I like to read about him (Modi) ... I know he will become PM'". The Financial Express. 1 February 2014. Archived from the original on 2 January 2015. Retrieved 13 April 2014. ^ Mukhopadhyay 2013, A time of difference. ^ Bodh, Anand (17 February 2014). "I am single, so best man to fight graft: Narendra Modi". The Times of India. Archived from the original on 13 April 2014. Retrieved 13 April 2014. ^ "Jashodaben is my wife, Narendra Modi admits under oath". The Times of India. 10 April 2014. Archived from the original on 10 April 2014. Retrieved 11 April 2013. ^ "PM Narendra Modi takes blessings from mother Hiraba on his 66th birthday". The Times of India. Archived from the original on 22 September 2016. Retrieved 17 September 2016. ^ "10 facts to know about Prime Minister Narendra Modi". 23 October 2012. Archived from the original on 23 September 2018. Retrieved 23 September 2018. ^ Harding, Luke (18 August 2013). "Profile: Narendra Modi". The Guardian. Archived from the original on 17 May 2014. Retrieved 17 April 2014. ^ "The Hawk in Flight". Outlook India. 24 December 2007. Archived from the original on 27 September 2014. Retrieved 17 April 2014. ^ "Narendra Modi on Google Hangout, Ajay Devgn to host event". The Times of India. 31 August 2012. Retrieved 3 September 2012. ^ "People ask, Narendra Modi answers on Google Plus Hangout". CNN-IBN. 1 September 2012. Archived from the original on 4 September 2012. Retrieved 3 September 2012. ^ Sharma, Swati (6 June 2014). "Here's what Narendra Modi's fashion says about his politics". The Washington Post. ISSN 0190-8286. Archived from the original on 27 January 2015. Retrieved 24 January 2015. ^ Friedman, Vanessa (3 June 2014). "Narendra Modi, the Prime Minister of India: A Leader Who Is What He Wears". The New York Times Runway blog. Archived from the original on 28 January 2015. Retrieved 24 January 2015. ^ Price, Lance (24 March 2015). The Modi Effect: Inside Narendra Modi's campaign to transform India. Quercus. pp. 179–180. ISBN 978-1-62365-938-7. ^ Marino 2014, pp. 60–70. ^ "Narendra Modi on MS Golwalkar, translated by Aakar Patel – Part 1". Caravan. 31 May 2014. Archived from the original on 10 June 2015. Retrieved 20 June 2015. ^ "Jyotipunj: Narendra Modi writes on 'my organisation, my leaders'". Economic Times. 9 April 2008. Archived from the original on 21 June 2015. Retrieved 20 June 2015. ^ Ramaseshan, Radhika (2 July 2013). "Boomerang warning in article on 'polarising' Modi". The Telegraph. Kolkata. Archived from the original on 11 November 2013. Retrieved 15 August 2013. ^ Malik, Ashok (8 November 2012). "Popular but polarising: can Narendra Modi be PM?". Hindustan Times. Archived from the original on 10 February 2013. Retrieved 15 August 2013. ^ Bajaj, Vikas (22 December 2012). "In India, a Dangerous and Divisive Technocrat". The New York Times. Archived from the original on 28 December 2012. Retrieved 15 August 2013. ^ "NaMo, Ram the new mantra on Dalal Street!". The Economic Times. 15 September 2013. Archived from the original on 11 January 2015. Retrieved 16 September 2013. ^ Zainulbhai, Hani (17 September 2015). "Indians adore Modi". Pew Research. Archived from the original on 14 November 2016. Retrieved 17 February 2017. ^ "PM Modi's approval rating remains high 2 years into term: poll". Live Mint. 23 May 2016. Archived from the original on 26 May 2016. Retrieved 28 May 2016. ^ "India and Modi: The Honeymoon Continues". Pew Research. 19 September 2016. Archived from the original on 17 February 2017. Retrieved 17 February 2017. ^ Nida Najar (20 September 2016). "PM Narendra Modi retains broad support in India despite criticism, poll finds". The Economic Times. Archived from the original on 16 November 2016. ^ "Three Years In, Modi Remains Very Popular" (PDF). Pew Research. 15 November 2017. Archived (PDF) from the original on 15 November 2017. Retrieved 16 November 2017. ^ "Modi Govt gets high approval rating at three-year mark in TOI poll". The Times of India. 25 May 2017. Archived from the original on 21 August 2017. Retrieved 14 August 2017. ^ "PM Narendra Modi 'By Far' Most Popular Figure In Indian Politics: Pew Survey". NDTV. 16 November 2017. Archived from the original on 1 December 2017. Retrieved 26 November 2017. ^ "Making Up For Lost Time". India Today. 12 February 2007. Archived from the original on 13 February 2007. Retrieved 12 February 2007. ^ "Why Narendra Modi is India's Most Loved and Loathed Politician". Time. 16 March 2012. Archived from the original on 3 April 2014. Retrieved 17 April 2014. ^ "List of winners of Indian of the Year 2014". 17 March 2015. Archived from the original on 8 May 2015. Retrieved 17 February 2017. ^ Zakaria, Fareed (23 April 2014). "The 100 Most Influential People: Narendra Modi". Time. US. Archived from the original on 25 April 2014. Retrieved 25 April 2014. ^ Obama, Barack (16 April 2015). "The 100 Most Influential People: Narendra Modi". Time. US. Archived from the original on 14 December 2016. Retrieved 15 December 2016. ^ Mishra, Pankaj (20 April 2017). "The 100 Most Influential People: Narendra Modi". Time. US. Archived from the original on 25 April 2017. Retrieved 25 April 2017. ^ Worland, Justin (8 December 2014). "Narendra Modi wins reader's poll for Time Person of the Year 2014". Time Magazine. Archived from the original on 25 February 2017. Retrieved 17 February 2017. ^ Gajanan, Mahita. "Narendra Modi wins reader's poll for Time Person of the Year 2016". Time Magazine. Archived from the original on 14 February 2017. Retrieved 17 February 2017. ^ "The World's Most Powerful People 2014". Forbes. November 2014. Archived from the original on 6 November 2014. Retrieved 6 November 2014. ^ "The World's Most Powerful People 2015". Forbes. December 2015. Archived from the original on 22 December 2016. Retrieved 15 December 2016. ^ "The World's Most Powerful People 2016". Forbes. 14 December 2016. Archived from the original on 14 December 2016. Retrieved 15 December 2016. ^ "The World's Most Powerful People 2018". Forbes. 8 May 2018. Archived from the original on 9 May 2018. Retrieved 10 May 2018. ^ Dieterich, Robert S. (September 2015). "Bloomberg Markets Most Influential". Bloomberg. Archived from the original on 8 June 2017. Retrieved 9 June 2017. ^ "World's Greatest Leaders 2015: Narendra Modi". Fortune Magazine. Archived from the original on 22 February 2017. Retrieved 17 February 2017. ^ "Narendra Modi and Kailash Satyarthi are world's greatest leaders, says Fortune Magazine". Business Insider. 27 March 2015. Archived from the original on 30 March 2015. Retrieved 5 April 2015. ^ "GIA poll: Modi ranks third after Merkel, Macron in global ratings of top world leaders; best ever rank for an Indian PM - Firstpost". www.firstpost.com. ^ "GIA Poll 2017: Narendra Modi ranks third, the highest for an Indian Prime Minister". 12 January 2018. ^ "Modi Ranks Record Third Among World Leaders By GIA Poll". www.socialpost.news. 12 January 2018. ^ "London: PM Modi's wax statue unveiled at Madame Tussaud's Museum". Indian Express. 28 April 2015. Archived from the original on 25 April 2017. Retrieved 25 April 2017. ^ "Narendra Modi's wax statue unveiled at Madame Tussaud's Museum". Business Standard. 2 April 2015. Archived from the original on 8 June 2016. Retrieved 25 April 2015. ^ "The 30 Most Influential People on the Internet". Time. 5 March 2015. Archived from the original on 21 March 2015. Retrieved 6 March 2015. ^ "Twitter: Heads of state with the most followers 2018 | Statistic". ^ "With 41.7 million followers, Modi becomes most followed world leader on Facebook". Economic Times. 27 May 2017. ^ "PM Narendra Modi most followed world leader on Instagram". India Today. 6 December 2018. ^ "Narendra Modi | Champions of the Earth". web.unep.org. Retrieved 24 October 2018. ^ "PM Modi receives UN's 'Champions of the Earth Award', says Indians committed to saving environment". The Indian Express. 3 October 2018. Retrieved 24 October 2018. ^ "PM Narendra Modi receives UN's Champions of the Earth Award". The Economic Times. 3 October 2018. Retrieved 24 October 2018. ^ "Prime Minister Modi Awarded the 2018 Seoul Peace Prize". ^ "PM Narendra Modi biopic full cast details: Vivek Oberoi, Boman Irani, and more join the film | Bollywood News". www.timesnownews.com. Retrieved 29 January 2019. ^ "Modi conferred highest Saudi civilian honour". Hindustan Times. 3 April 2016. Archived from the original on 8 February 2017. Retrieved 17 February 2017. ^ "PM Modi conferred Afghanistan's highest civilian honour". Indian Express. 4 June 2016. Archived from the original on 31 December 2016. Retrieved 17 February 2017. ^ "Modi conferred 'Grand Collar of the State of Palestine'". The Hindu. 10 February 2018. Archived from the original on 3 March 2018. Retrieved 3 March 2018. ^ "PM Modi awarded highest civilian honour Zayed Medal by UAE". India Today. April 4, 2019. ^ "Russia awards Narendra Modi its highest order, PM thanks Putin". India Today. April 12, 2019. Retrieved 12 April 2019. Guha, Ramachandra (2008). India After Gandhi: The History of the World's Largest Democracy. Harper Perennial. ISBN 978-0-06-095858-9. Kochanek, Stanley; Hardgrave, Robert (2007). India: Government and Politics in a Developing Nation. Cengage Learning. ISBN 978-0-495-00749-4. Marino, Andy (2014). Narendra Modi: A Political Biography. HarperCollins Publishers India. ISBN 978-93-5136-218-0. Mukhopadhyay, Nilanjan (2013). Narendra Modi: The Man, The Times. Westkabd. ASIN B00C4PGOF4. 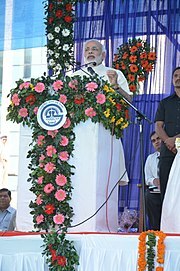 Wikimedia Commons has media related to Narendra Modi.